What Percent of People Are Attractive? It would take too many research and calculation in order to answer this question in a comprehensive and accurate manner. Since even height is a measurable trait of attractiveness, just how tall a man should be in order to qualify as “attractive” is still subjective to some extent. But let’s say he has to be at least 6 feet tall (182 cm). Note you can still use this methodology to change the “minimum height threshold parameter” and you’ll get a valid result for your chosen threshold. 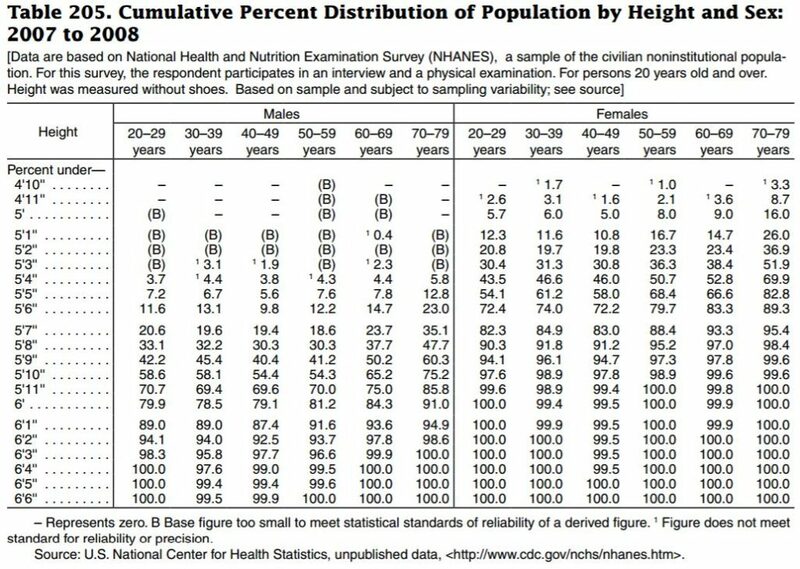 So males under 6′ tall make up 79.9% of the US population aged 20–29 years old. Which means there are 20.1% potentially attractive males, based on height alone. Sorry that I still haven’t provided a definite answer, but at least I have narrowed it down: Attractive males make up less than 20.1% of the US population. Now all you have to do is narrow it further for other traits: weight, wealth, facial features, and so on. The percentage would decrease even more for each trait you add. 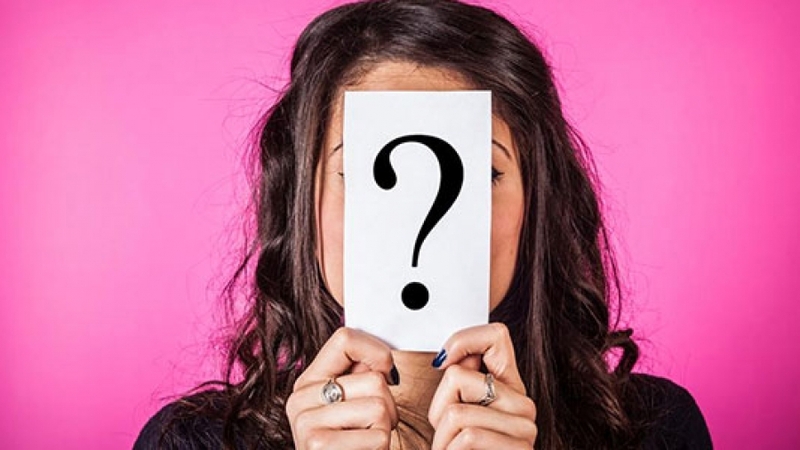 Some of the traits would have extremely high variation of subjectivity that you’d need to create different versions of your study for each target audience. For example: political orientation, religion. My opinion? I myself don’t need to know the exact number. I am satisfied with a fuzzy answer of “very few” which is accurate enough for some of the objective traits and given the high variation of subjective traits. So, armed with this newfound knowledge, what would you do about it? What Are The Most Important Attributes A Man Needs in A Woman? No that isn’t all. There are many more. Yet every man has different preferences and priorities. How Do I Keep Up With It? You really don’t have to. What you should do depends on your current situation: are you still looking for a man, or you’re already in a relationship with a man? For those attributes you’re already good at, keep it up! For example, if you’re a good listener (yep, a rarity among women), see if your crush appreciates it. For those attributes you’re not so good at, make effort to improve at least some of it, gradually. For those attributes you’re terrible at, you’ll need to fix it. For example, if you’re rude and mean to (some) people, it’s time to learn how to be polite and compassionate. While I said “only”, it’s actually a lifetime work. But you need to start now. There is always a reason to improve yourself. And in the unfortunate case if you later break up with him, you’ll become a better person. I Feel Ugly, What Choices Do I Have? Improve your health and your attitude, be a fun and warm person. The reason is there are several (actually many!) traits men want from women, looks is only one factor. Other than inner beauty (attitude), health is probably most overlooked. Not smoking, not drinking alcohol, and a healthy habit of exercise and hygiene care is a plus that will be appreciated by him and his family. You’re right that (too much) make up is not good, it can even be bad for your skin’s health. Being more intelligent is another way. But being intelligent and nice at the same time, that takes practice and sincerity. And that makes a woman more attractive than other not-so-intelligent and not-so-nice women, regardless of looks. There’s no need to deny that attractive women do have more choices in attracting men, even the simple act of them being there can attract men. Accept that fact and realize that unattractive women still have choices too. 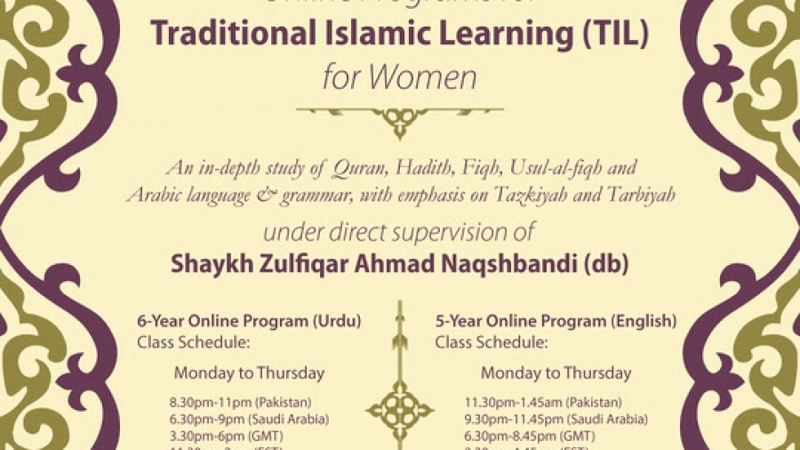 eMahad is offering an Online Traditional Islamic Learning Program in English language covering in depth study of Quran, Hadith, Fiqh, Usul al Fiqh, Arabic Grammar and Language. The program will be taught by teachers from different parts of the world who have studied traditional Islamic disciplines from countries including South Africa, UK, US and Pakistan. All teachers are senior students of Shaykh Zulfiqar Ahmad Naqshabandi (db). The classes will be conducted in English with no reliance on Urdu language, through state-of-the-art paid online classroom software. The program is conducted free of cost. InshaAllah the Classes will start from 31st August, 2015. 1: I only understand basic Urdu and I am more comfortable in English which program should I join? Ans: There will be two separate Online Traditional Islamic Learning programs run for women, one in English and one in Urdu. In the English Program, all lectures delivered and all texts used will be in English or in Arabic. In both programs, a strong focus will be on learning Arabic in the initial years. Examinations will be conducted in the respective languages of the programs. 2: What is the fee for this course? Ans: The course is run for free. 3: How will I get the books/texts? Ans: We will try to arrange soft-copies/scanned versions of all books that will be taught during the program. Those of you are based in countries where books are available would be encouraged to purchase their own book set. 4: Which curriculum will be followed? Ans: A five year curriculum is designed based on the curriculum of Wifaq ul Madaris al- Arabiya Pakistan’s curriculum. Our curriculum has some additional features to cater to the needs of our global audience. The subjects covered include Quran, hadith, fiqh, usul al fiqh, Arabic language and grammar. 5: How are the examinations conducted? Ans: Internal examinations by eMahad will be conducted during the year and also final examination will be conducted online. Those of you who can visit our parent institution Mahad al Faqir al Islami in Jhang, Pakistan or at our affiliated institutes in different parts of the world will be asked to sit for onsite exams conducted by eMahad. 6: Can I give Wifaqul Madaris al Arabiya Examinations? Ans: As per the rules of Wifaqul Madaris al Arabiya the students who study the program online are not allowed to sit in the exams conducted by the body. 7: What degree will I receive by the end of the course? Ans: By the end of the course, Mahad al-Faqir al-Islami, Jhang will issue you a degree. 8: How are the classes going to be conducted? Ans: Classes will be conducted online through state-of-the-art classroom software. 9: Will I have access to recordings if I miss any class? Ans: Yes, recordings will be made available after every class. 10: Do I have takraar/practice sessions in addition to the teaching sessions? Ans: Yes, there will be 2-3 hours of takraar/practice sessions per week. 11: How much weekly workload should I expect in total? Ans: Initially for the first 6 months, the total workload will be around 10-12 hours per week.